Now that Comet ISON is heading for a close encounter with the sun in late November 2013, the Internet is again abuzz with UFO ghost tales, not to mention doomsday theories, mysticism, and miscellaneous strange ideas that go bump in the night. This entry was posted in An Astrological Miscellany: of cusps, virgins, atomic scientists, Muhammad Ali and much, much more...(13 articles) and tagged Amateur astronomy, Astronomy, C/2012 S1, Close encounter, Comet, Comet ISON, Small Bodies, Solar System. Bookmark the permalink. Personally, I’m hoping Ison holds it together. I’ve read a few suggestions that, as it approaches the sun, the forces involved may lead to disintegration. It will be interesting to see what happens. 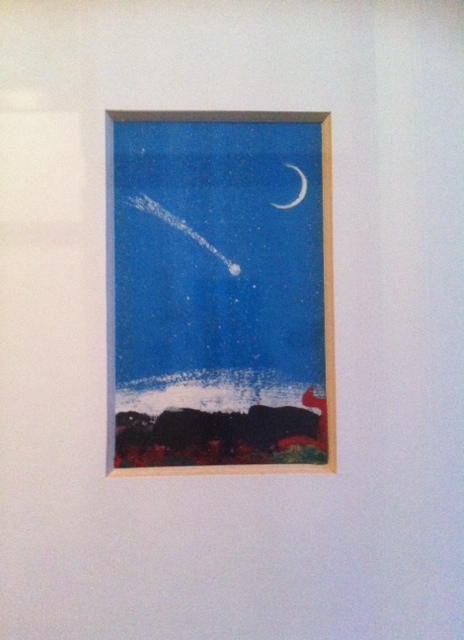 Even as a child, I never thought of comets as anything but celestial occurences. I loved them, and the idea of them, but I never really thought of them as omens or portents of terrible things. 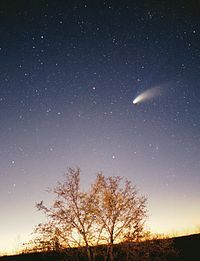 I do remember going through a phase where I seriously considered whether the star of Bethlehem might have been a comet. It seemed like a reasonable explanation. Now? I’m just waiting on Ison. That’s a wonderful painting you have – a great remembrance of Halle-Bop and your friend. Thanks, Linda. My brother saw the Halle-Bop whilst on a night sail off the Scottish coast: calm seas, and no light but the stars, the comet blazing a bright streak through the heavens. How I wished I had been there! However, as you say, it’s great to have my own personal memento.